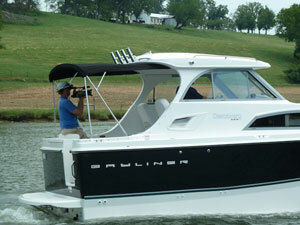 Lenny Rudow reviews this simple, easy to maintain bowrider from Bayliner. Guess what I just discovered? Bayliner's 195 Discovery. Now this is a very simple straightforward bowrider. 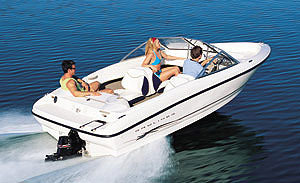 It has a single stern drive, and it's outfitted so that you can use it for just about any kind of water play you like. Fishing, waterskiing, whatever. I tested it to find out if it was the right boat for you. We have Matt Guilford here from Bayliner Boats to help us understand what this boat's all about. How you doing, Matt? Matt: Good! Good to see you Lenny. So tell me, this is the 195 Discovery. What makes it a Discovery and what's the Discovery series all about? Matt: Bayliner's Discovery series is made up of easy to maintain, functional boats that give customers the opportunity to get out there and explore. Now one of the things that really jumped out at me about this boat is the nonskid. It's textured, it's grippy, it's rubbery. Matt: It's perfect for the Discovery. With the wide open floor plan you can bring scuba gear, camping gear, the dog. You can just hose it down when you're done. One of the things that I really like about the way the Discovery is built is the fact that the stringers are installed in the hull when it's still in the mold. Why don't you talk about what that does for you? Matt: When we pull the hull out of the mold it gives it a lot more strength and integrity. 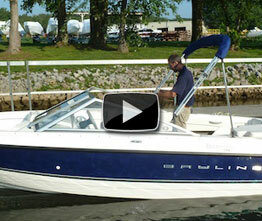 In fact we offer a lifetime structural hull warranty on all of our Bayliner runabouts. Now Matt, I notice there's no insulation in this motor box. Why is that? Matt: You know the Discovery series really appeals to boaters who place a premium on open space, and easy to maintain designs. That's one of the tradeoffs we made to help keep the price down. Now one construction detail we haven't touched on yet that we should definitely take note of is these cleats. They're not nylon or plastic, they're stainless steel. There are three of them. There's a stern cleat, a spring cleat, and a forward cleat. And I poked my head up underneath the inwale where the camera won't go and saw that they're all backed up with washers and nylon lock nuts. Need to do some work on the electrics? No problem. All the fuses are right here. All your wiring is right up here easily reachable underneath the helm. And it's all nicely loomed and taped together too. This boat has 135 HP. We cruised at about 28.5 mph, and at top end hit 41. That's really plenty of power for this boat. You ready to do some water skiing? Don't worry, this boat has plenty of power to yank you right out of the hole. Just remember, this means faster, this means slower, this means okay. 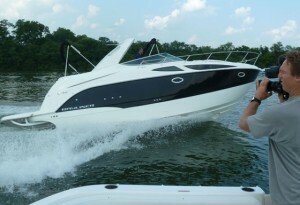 Even though this is an inexpensive boat, Bayliner outfits it nicely. It has a really large swim platform on the transom. And here we have a nice seat that comes down into a lounge. So you can really stretch out and enjoy yourself. There's also of course a nice cockpit in the bow with seating. And check this out: a 120 watt stereo. You know one thing I can't stand about a lot of new boats? They're built overly complex. That makes them difficult to maintain and difficult to use. That's not a problem here. This is a simple, straightforward boat that gets the job done. It's easy to clean up and it's easy to use. Just as importantly, it's also very inexpensive. If you're looking for a ninteen foot bowrider that falls into this category, this is definitely one you're gonna want to look at.